OCR PDF to Word, Excel, etc. 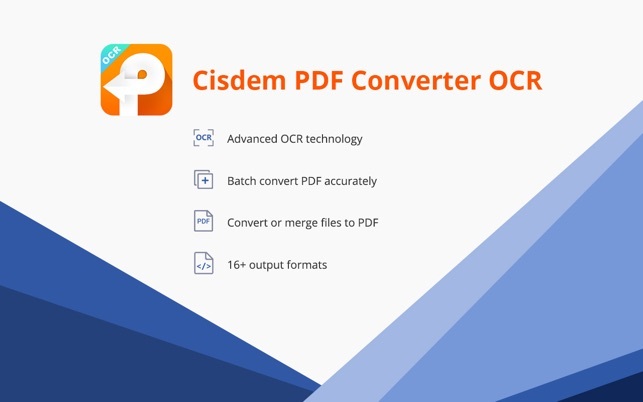 Cisdem PDF Converter OCR is a PDF Converter with OCR capability. it can accurately convert normal or scanned pdf to Word, Excel, Pages, Image, Text, Html, Keynote, etc. Besides, it also supports create professional looking PDF document from existing files like Word, PPT, Text, Html, CHM, etc. 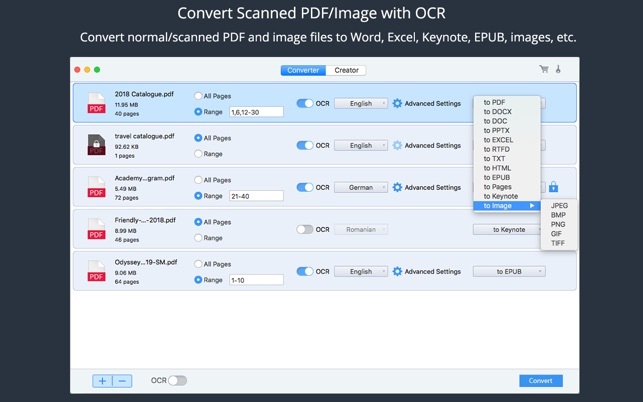 • Convert native & scanned PDF to Word, Excel, Keynote, Pages, EPUB, PowerPoint, Text, Images and more. 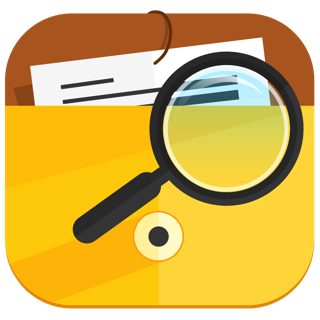 • Convert scanned PDFs to editable and searchable PDF document with ease. 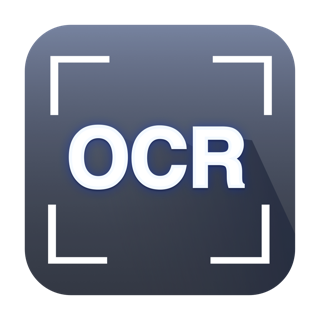 • Obtain best OCR results: OCR PDF files precisely, get up to 99.8%-character recognition accuracy with advanced OCR technology. • Process PDFs in batch or partially: You are able to convert a bunch of PDF files or convert PDF selected specified pages (e.g. 1,3-10,21 or all pages). • Convert large PDF files (500 pages or more) in mins. • Convert encrypted PDFs supported. • Convert image to text files like image to word, excel, ppt, etc. • Extract text from images. 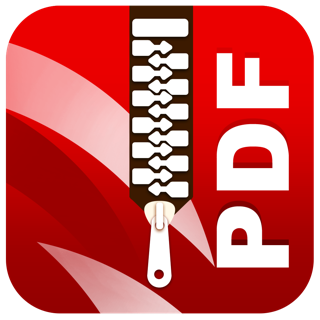 • Convert PDFs to 16 formats: PDF, DOCX, DOC, PPTX, PAGES, XLSX, RTFD, TEXT, KEYNOTE, EPUB, HTML and Image (JPEG, BMP, PNG, GIF, TIFF). • Recognize approx. 200+ languages. And multiple languages supported, you can convert a PDF document with mixed languages. • Convert Word, ePub, PPTX, RTF, CHM, Txt, HTML files into PDF files with clicks. • Convert or merge files to PDF easily. • Create professional looking PDF from multiple documents at a time. 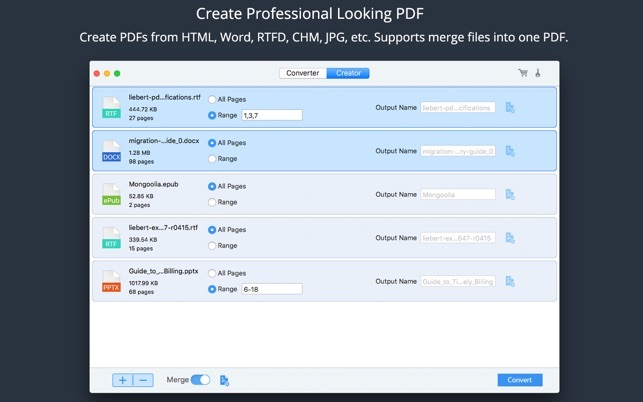 • Supports merge files into one PDF file. Just Drag-n-drop to rearrange multiple documents and designate certain pages to merge into one PDF. • You are able to set the PDF size you want to create, such as the A3, A4, Envelope, etc. • Select the quality (high, medium, low, original quality) of output PDFs to save the space. 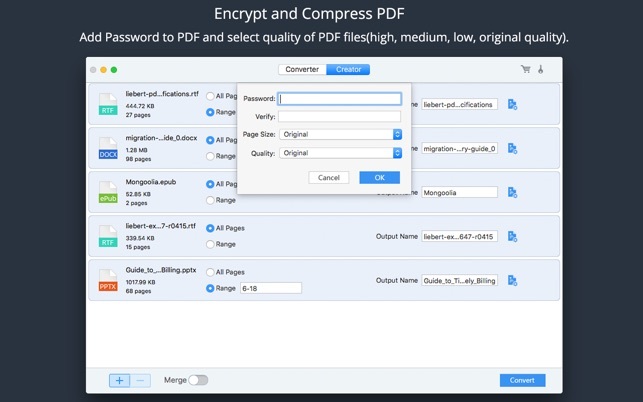 • Supports adding Password to your PDF files for protecting the data. 2. Improved OCR memory usage performance. 3. Fixed the blank page issue when converting PPTX to PDF. 4. Corrections and improvements on many small details. 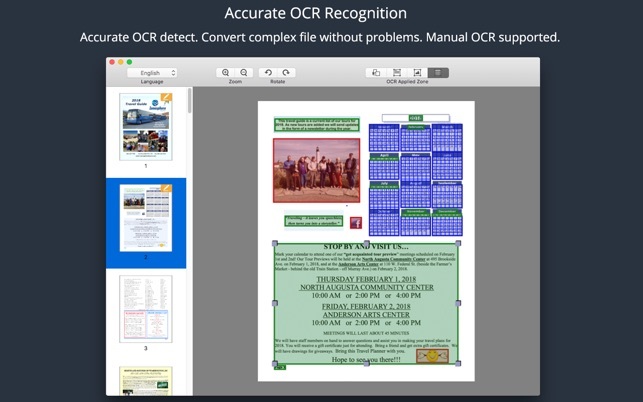 After pulling my hair out trying to find an app that does a good job of OCR on the Mac, I was blown away by the OCR capabilities of PDF Converter. I had created a test bed of some scanned pages that I ran through to test the OCR capabilities of different apps (including some with challenging pages). This app was the ONLY one that gave me great OCR results. All the big names apps gave me what I consider unsatisfactory OCR results (such as sometimes introducing spaces within a word). While the app is not “cheap”, it is priced below the major competition. In my tests, it did a great job of converting my samples into Word (DOCX) and also creating PDFs that have a text layer so the text may be searched and/or copied. 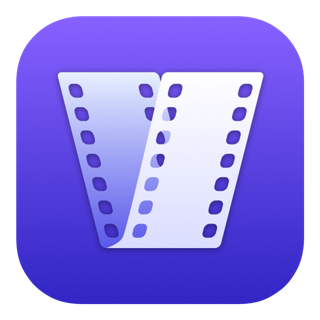 Given the huge number of scanned pages I have to deal with, I’m now confident that this app will be up to the challenge! As I wish all developers would do, they provide (via their website) a downloadable trial app with a limitation on # of pages that can be processed. Dear Customer, glad to hear that Cisdem PDF Converter OCR did a great job for you! We will try our best to develop and upgrade the best PDF Converter with OCR technology. Thanks for your support! Most of the time I don't need a PDF converter, but when I do it's important that it can both reliably "read" and format the document into a useable format. So far this app has done a great job for me. Its ability to format documents very close (sometimes exactly) to the original in a Word or Pages format is first rate. I've seen the app do this with fairly complicated layouts. At other times I need a simple text conversion and, of course, it does that very well. I found the app intuitive and easy to use. Most impressive is the number of formats it will convert to, making it a very useful tool. Hello mitchellsf, glad to hear that PDFConverterOCR works well for you. We will keep update and make the best PDF Converter for you. Thanks for your support. I bought this primarily to convert existing PDF documents (PowerPoint presentations that were saved as PDF) back into PowerPoint format. The trial version is very limited, so it was difficult to tell if the product was going to be able to do what I wanted. Unfortunately, I ended up buying the software, but now I wish I could get my money back. It tries to do a decent job, but most of the time I get a bunch of blank pages and a lot of slides that look nothing like the original PDF. I’m pretty disappointed in the product’s ability to convert PDF files into PPTX format. Maybe it’s good for other things when dealing with PDF documents, but it is certainly not masterful at converting PDF documents to PPTX format. Copyright © 2019 Cisdem Inc. All rights reserved.